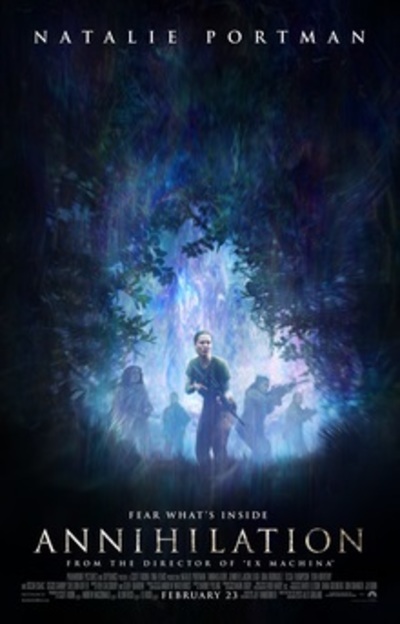 Annihilation is a 2018 sci fi/horror film written and directed by Alex Garland, writer of the novel The Beach and the screenplays of the films 28 Days Later (2002) and Sunshine (2007). It is based on the novel of the same name by Jeff Vandermeer. It stars Natalie Portman as Lena, an ex soldier whose husband goes missing in action. One day he reappears out of the blue at their home, before being taken ill, and is taken away to a military facility where Lena learns he was part of a team who went into "the Shimmer", a mysterious quarantined area no-one knows anything about. Lena agrees to join a team to go into the Shimmer and find its source. Paramount Productions, who financed the film, wanted Garland to change the ending, but he refused, as a result of which the film did not get a theatrical release outside of the United States, and is streaming on Netflix instead. Have you seen it? If so, did you like the ending, or do you think it should have been changed? For the most part I liked the way the ending wasn't too clear cut and didn't explain everything neatly. The music in the climax bothered me though, because I found it distracting and that took away my suspension of disbelief.